This morning Safaricom launched a product they say cost them 25 percent of their marketing budget, the Safaricom Blaze. 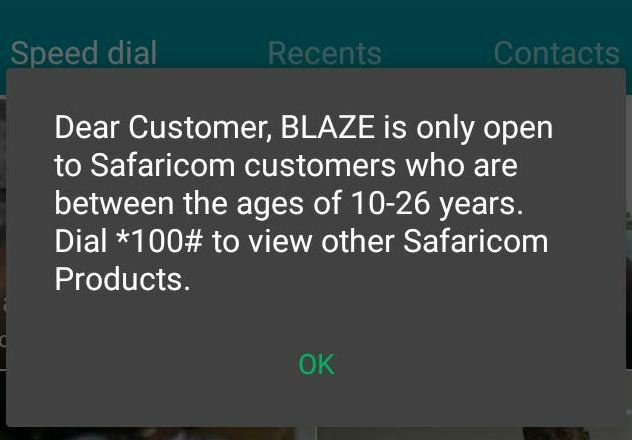 According to Safaricom, Blaze is a sub-brand of Safaricom created to give youth aged 26 years and below a wide range of products, services and benefits tailored specifically to meet their everyday needs, including mobile communication needs. Other benefits that Safaricom has promised to the young Kenyans aged 10 to 26 years is to give them control on how they’ll spend their Airtime, give them an opportunity to be mentored by successful entrepreneurs, fund their business ideas, and offer them a chance to appear in Blaze BYOB (Be Your Own Boss) TV Show. 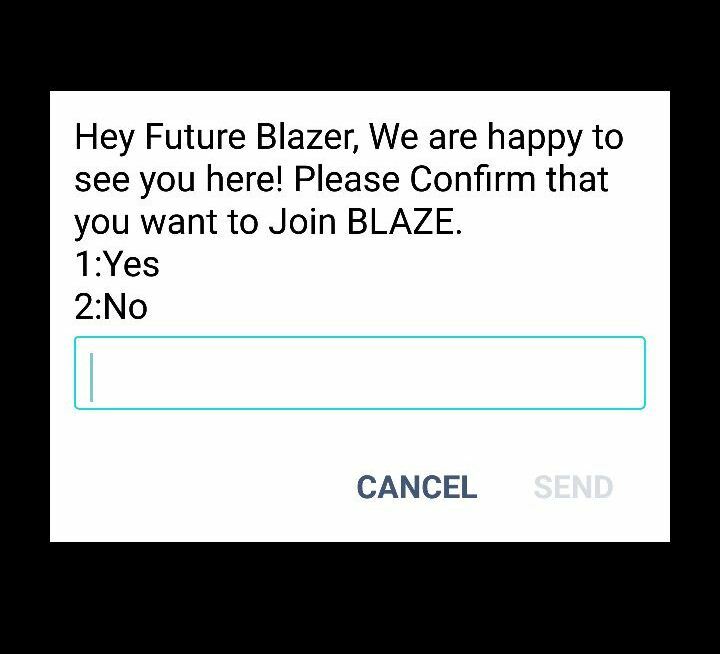 Excited with the announcement, I rushed to dialing the Safaricom Blaze shortcode which is *555# to see if I could peek into what Blaze has to offer the youth, but Safaricom did not hesitate to remind me that they have my age in their database. By the way if you have those girlfriends who insist on being 22 but you suspect them to be as old as a granny, just ask them to dial *555#. Too bad I could not peek into Blaze but I badly needed to have a feel of how this new Safaricom products looks and feels like. After contacting a few friends that I thought were aged below 26 years with no luck, Winnie Kuria came to my rescue. She was able to access the Safaricom Blaze USSD portal from where she sent me screenshots showing various steps and products those young Kenyans will be able to enjoy within the Safaricom Blaze platform. After dialing *555#, and if you are aged 26 years and below, you should be able to see the screen below, from where you can proceed to register by replying with 1. 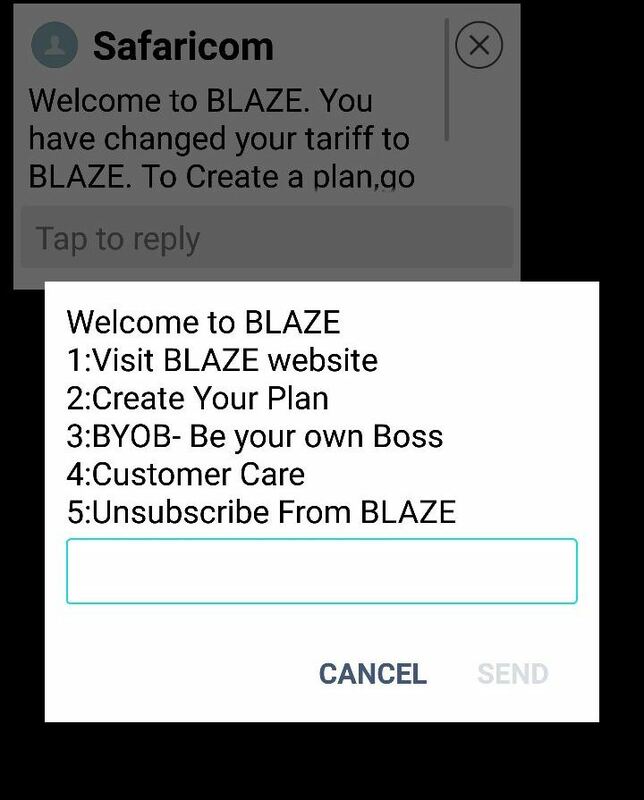 After registering to Blaze, the USSD feedback will prompt you to either create you blaze plan or Be Your Own Boss. By creating your blaze plan you will be able to take control of how your newly purchased Airtime is spent on calls, data and text messages. “If, for example, you buy 100 bob worth of credit, you have the freedom to choose how much of that should go into data, voice or SMS, depending on your preferred usage. To do this, all you have to do is go to the BLAZE website and, using a simple slider, swipe left or right to select how much goes to each service,” said Sylvia Mulinge, Director for Consumer Business – Safaricom. “Those who prefer not to do this online can do so by dialing *555# and following the prompts. Whichever way you choose to do it, you have the freedom to control what your airtime goes to,” she added. Besides targeted mobile services, BLAZE subscribers will also get mentorship opportunities, with a lucky few also getting the chance to win funding for their businesses through Be Your Own Boss (B.Y.O.B). B.Y.O.B, a brand asset under BLAZE, will consist of a series of countrywide youth empowerment summits and boot camps. During these, young people will have the opportunity to tell their stories, share their ambitions and interact with mentors who will inspire them and guide them on their journeys to chasing their passions. These mentors have been drawn from various fields including the arts (music, fashion, photography, graffiti, film), technology, entrepreneurship and agriculture. The B.Y.O.B Summits will also give young people a chance to audition for the BLAZE TV show, also called Be Your Own Boss. This show will offer a select few the chance to compete for funding that will enable them chase their dreams and build careers out of them. Safariocm said that Blaze has been developed for more than a year, and in addition to providing the youth with opportunities to spend their airtime wisely, have entrepreneurial dreams, and access mentorship programmes, Blaze will also see subscribers have access to cool branded 3G and 4G enabled devices such as the Blaze Flame, which will retail for Kshs.10,000 + a free selfie stick and phone cover, exclusively from Safaricom shops. Different elements of the platform will be rolled out over the coming months. These include a music app that will allow subscribers to stream and download music, and share their playlists with friends. BLAZE subscribers will also have access to innovative new M-PESA-based services that will encourage the youth to take control of their finances, as well as BLAZE Bonga, which is a loyalty programme with rewards that appeal specifically to the youth. For those of us wondering why Safaricom has locked those above 26 years of age out of this great product and opportunity, the reason Safaricom has settled for the 26 years and below age group is because Safaricom is banking on the youth to deliver 25 per cent of its future growth, in terms of both customer numbers and revenue, by offering more relevant products and services to this segment. Now that most of us tech bloggers are locked out of Blaze, I highly recommend for those of you who have access to Blaze to use it, and report to us any exciting features you will be experiencing. We particularly encourage you to get to us if there are any issues that will come along the way that you would like voiced. Most importantly, take the Safaricom Blaze opportunity and dare to dream – you never know, Safaricom Blaze may just be the platform that will finally actualize your dream of becoming a superstar in the music, film, art, business, or the technology worlds. Uber Kenya to provide loans for Kenyan taxi drivers to grow their business.